If Cameron George has any nerves heading into the new NRL season, he's certainly not showing it. The Warriors' CEO is typically bullish about the prospects of his club, though as an organisation the Auckland franchise have plenty to prove in 2019. If last year's playoff place was celebrated as a surprise bonus, this year it will be marked as a bare minimum. 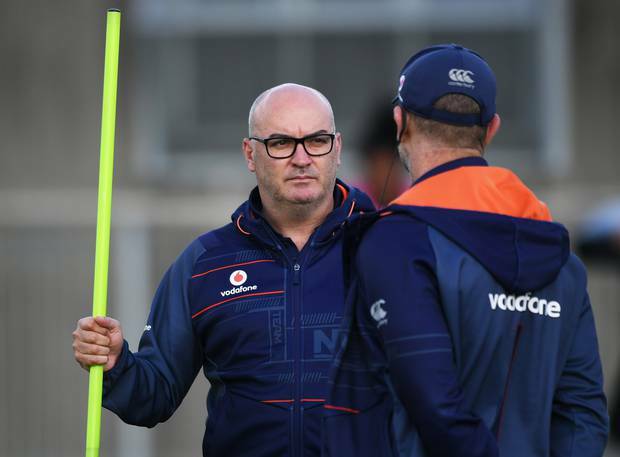 The Warriors will also need to deal with the uncertainty created by the departure of Shaun Johnson — with no obvious, proven successor at this stage — and cope with the vacuum created by the absence of the retired Simon Mannering, after 15 years of relying on his graft and grit. And the competition is expected to be tougher this year; the Cowboys will be back, the Knights are on an upward trajectory, the Bulldogs will surely improve, the Raiders can't misfire again and Michael Maguire is expected to have a big impact at the Tigers. And that's just some of the teams that missed out on the top eight last season. "We will have a very hard working, competitive unit," George told the Herald. "I see kids trying their guts out to play NRL for the Warriors. "The change in the space of 12 months…at this time last year you might have walked up to the training paddock and seen six standouts…this year there is 28. I've seen the standard of the younger kids go to a completely new level. You look at our squad…we are going to brick wall it this year. It's exciting." The Johnson situation was the biggest flash point of George's tenure so far. The straight shooting Australian isn't one to dwell on things and is eternally optimistic and future focused, but admits he harbours some regrets over the acrimonious exit of the popular halfback last December, which was not something that anyone could have envisaged just a few months earlier. "In terms of the decision [to release Johnson]…we are fine with it," said George. "We have no problems with it and believe it was the right decision, for both parties. Naturally we gave it a lot of thought when we were asked by Shaun but we didn't depart from what we believed was right for our club. But I'm not too big to stand here and say I couldn't have handled it better." Johnson's exit descended into an ugly war of words, with the Warriors issuing a terse press release, which barely acknowledged his contribution to the club eight seasons, followed days later by some speculation from club sources about Johnson's leadership attributes and work ethic. The Kiwi halfback pitched in with his own accusations on social media immediately following the transfer, as the saga got uglier. "Hindsight is a great educator and I'm not bigger than this organisation to say we got it right and he got it wrong," said George. "And that's life; you learn, and I'll continue to learn as I have learnt many other things over the last 12 months that I can do it better. "Shaun's a terrific kid and gave the Warriors great service here. And he will do fantastic at another club. And equally, we are so confident and supportive of our young kids that are coming through to fill his shoes. We have moved on and Shaun has moved on." George is excited about the opportunity provided for a young player – former Bulldog Adam Keighran and Junior Kiwi Chanel Harris-Tavita are the two leading contenders — to make a mark. "They have to start somewhere," said George. "Shaun started somewhere. Stacey Jones started somewhere, Allan Langer started somewhere. "When you have kids like that, why not give them a chance? So when Shaun departed it wasn't panic stations for us. We didn't feel like we needed to replace Shaun with another superstar. We could unearth one, for very good value which enables us to buy in other areas." The Warriors also now have a sizeable war chest – thought to be in excess of $1 million – to spend when the time is right. "We are not panicking, we are taking a deep breath," said George. "We are not saying that if someone becomes available tomorrow we won't sign them, but what we won't do is sign for the sake of signing. "If we get the balance of our squad right it is going to be outstanding. We might find someone next week, it might be that someone drops out of a squad in a few months…[but] we have never been in a position to go after a player early or mid-year." Off the field, George continues to drive innovation. The club announced on Friday a new scheme that essentially allows season ticket holders to walk away if they are not satisfied after round six, and he is also promising some novel 'retro' pricing options for the first match of the season, to try to ensure the biggest possible attendance for the opening game in their 25th anniversary year. There's also a special theme for this year's Easter weekend clash, which will see "the country come to town" and a ticket structure relating to post codes, so the further than you travel, the cheaper you admission will be. The club is also working on some new community based initiatives, which George hopes could have "hugely significant outcomes" for this country over time. "For me it is about having as many people as possible involved in this club, to enjoy the on field and off field activity here and I am sure it will flow into on field success," said George. "We need to keep challenging ourselves, come up with something different." But the ultimate measuring stick comes on the field, where the Warriors will hope to make the playoffs for just the fourth time this decade. "It's about preparing well, and representing our fans as best we can every time you pull on the jumper," said George. "Every time. If we do that, we'll be okay."